“I’m switching to another ESP. Will my deliverability improve or get worse?”. Of course you are expecting your open/clickthrough rate to consistently improve with the new ESP… but you’re still in for quite a shock, as deliverability tends to drop off in your first few mailings. Wait, don’t run, come back! This is par for the course when switching email vendors, although not many are honest enough to warn you about it. So why will your results with the new ESP get worse before getting better? Even if you stick to email marketing best practices and keep in good graces with Internet service providers? Hard bounces are dead or mispelled email addresses which wreck your sending reputation. The reason? Major ISPs such as Gmail, Hotmail and Yahoo look at your mailing list hygiene for signs that you’re spamming. Lots of undeliverables usually mean your list is not opt-in or that permission has gone stale, so ISPs will rightly shout “blasphemy” and flag your emails as spam. Any ESP worth their salt should automatically scrub hard bounces off your list the first time you mail it. If you are switching over from an email marketing service with no bounce handling (or if you used to do it yourself), this will be especially noticeable because you’ll see your list size shrink dramatically. Even switching between bounce-supressing ESPs often yields a higher bounce rate, as their detection criteria can vary. The damage caused by those extra bounces in your first mailings with the new ESP means your deliverability will initially plummet, only to improve after the list is fully cleansed. Switching to an ESP with a higher deliverability rate might actually work against you at first. Weird? The explanation is simple: your emails will now reach the inbox of people whose accounts were previously filtering you. Seems like great news, unless they aren’t interested in receiving your emails anymore, in which case they may report you for spam! This in turn lowers your ISP sending reputation, hurting your deliverability. Don’t worry though, good email marketing vendors maintain feedback loops with ISPs to take care of complaints and automatically unsubscribe spam reporters. After the first few mailings, your complaint rate should drop, allowing you to get your sending reputation back. Rule nr. 1 of spam filters: when in doubt, sniff it out! As soon as Gmail, Outlook.com or Yahoo realise your “postman” is different, they’ll set the alarm bells ringing and give both your new ESP and your emails a thorough pat down. Ever noticed how a dog’s attention will immediately zero in on someone new coming over? Yep, same thing here. While ISPs double-check that you’re a good sender and the email marketing provider is not attempting to phish you, they’ll be wary of your mailings until they give you the all-clear. You can make it easier for them by using your own sending subdomain instead of the ESP’s. Most email vendors allow you to set it up manually and some even provide you with a custom subdomain by default. Once ISPs finish sniffing your emails all over, they’ll move on to gauging how people respond to them (ie., whether subscribers open, click through and reply). That’s what engagement is all about and as long as you manage to build a relationship with your audience (always go for highly relevant, targeted mailings), your open/click trough rates should gradually rise. Gmail, Yahoo and many other ISPs have traffic rules in place governing how many emails you can send them in one sitting. This is known as throttling and if you fail to abide by the rules, ISPs will defer or block your emails altogether. So, if your old email vendor didn’t take this into account and just blasted out your mailings, it may look as if your new ESP takes longer to deliver them. 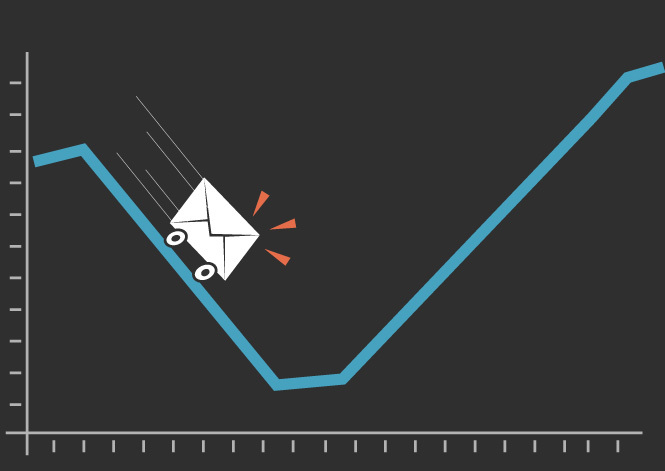 That’s exactly what’s happening, but going slower is required to ensure the highest chances of making it to the inbox. So what deliverability steps to take before switching to another ESP? First off, deliverability is just one step in the onboarding and switching process, there is a lot more to expect and deliver when switching ESPs, but deliverability is an important part. 1) Don’t just export your entire mailing list from your old ESP. Make sure to export only those subscribers who are active and engaged. This will prevent you from importing invalid or already-unsubscribed emails into your new ESP, which would ruin your sending reputation. 2) Think it’d be cool to halve the mailing list and send out a couple of mailings using both ESPs at the same time to compare how they perform? Think again! Besides skewing the baseline (the mailing lists won’t be the same and even the way both vendors calculate your open/clickthrough rates may vary), ISPs can frown upon it. Save yourself the trouble and just run with the new ESP. 3) If you want to compare between vendors, go for the right way to do it: create a few test accounts in Gmail, Hotmail and Yahoo and add them to your mailing list. You should only use these test accounts (also known as a seed list) to monitor delivery. Never open or click through any email landing there – look but don’t touch! Before migrating to the new ESP, use your old ESP to get a few mailings out the door to your whole list and check for delivery in the test accounts. After switching to your new ESP, do the same (make sure the mailing’s contents and subject line is not too dissimilar) and see how delivery shapes up against the old ESP. 4) Do you have any kind of integration, autoresponder or drip campaign in place at your old ESP? Take the necessary steps to reproduce it in your new email vendor (it might also be a good time to review it with your sales staff). If you’re getting a dedicated IP, the folks at your new ESP should help you warm your dedicated IP up. 5) This is a given, but it bears repeating. Make sure to always follow email marketing standards and best practices while using either vendor. Remember: there’s no magic formula to guarantee inbox delivery, but if you follow all the rules, you’ll have much better chances of making it through.